Remember when LEGO came under fire for its LEGO Friends line, a collection geared toward girls (finally! ), but which abandoned adventurous themes for a pastel color palate, taller and slimmer female minifigures, and cliche female-friendly scenarios like a suburban home, a beauty parlor and a horse stable? Well, despite the toy line being slammed as sexist and pandering (even spawning a hashtag movement to #LiberateLEGO), it has become a huge success. But not all little girls are satisfied with the domestic-themed options the toy company offers them, and one little girl in particular has decided to make her very dissatisfied voice heard. 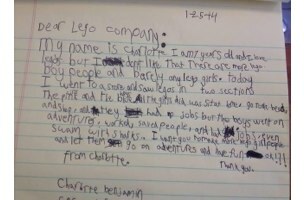 Seven-year-old Charlotte took it upon herself to write a strongly-worded letter to LEGO, criticizing the toy company for making more “boy people” than “lego girls,” and for sending boys on fantastic adventures while relegating girls to the mall and the beauty parlor. Young Charlotte, with multiple exclamation points and question marks, makes it quite clear that what she’s requesting really shouldn’t be that much to ask. 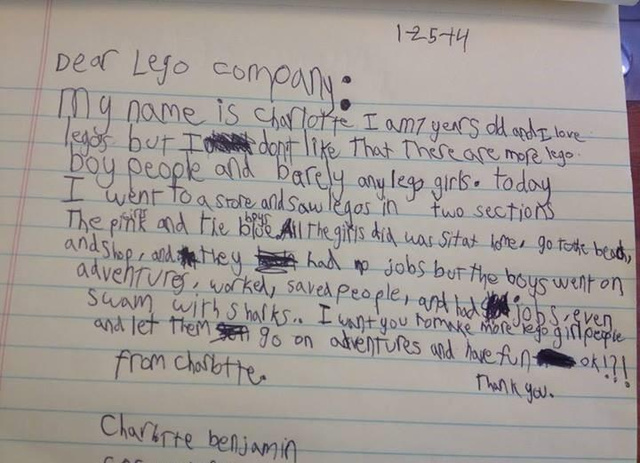 And considering LEGO’s excellent track record of responding to kids’ letters, perhaps hearing directly from its customer will finally inspire the company to listen. The situation can no longer be categorized as angry feminist women speaking for children–it’s a case of the children (the actual consumers) speaking loudly and eloquently for themselves. And the customer, especially in this case, it always right…right? The complete letter is below. Rock on, little Charlotte.